PARIS including: the Louvre, Eiffel Tower, Place des Voges, Place du Tertre, night boat ride, Hotel de Ville, Latin Quarter, and more. 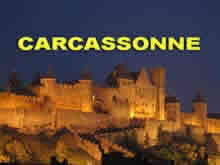 Carcassonne Many travel movies about one of the most magical medieval towns in Europe, surrounded by a huge wall and perfectly preserved as it looked five centuries ago. 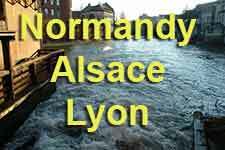 Many travel movies about Normandy, Alsace and Lyon Rouen, Amiens, Mt-St-Michel, Colmar, Strasbourg, Annecy, Lyon. 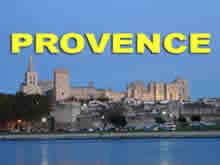 Provence: Many movies of Arles, Avignon, Aix en Provence, Marseilles, Nimes, Pont du Gard, Annecy, Lyon, Les Baux, St-Remy. 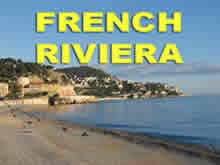 French Riviera: Cannes, Antibes, Nice, Grasse, Vence, St-Paul, Monaco. We really see the sights in these entertaining travel videos. 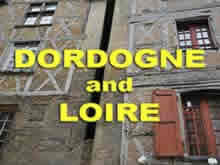 Dordogne and the Loire: Rouen, Amiens, Mt-St-Michel; Loire: Cheverny, Amboise, Chenonceau, Clos-Luce, Chambord, Azay, Chinon, Tours, Blois. Dordogne: Beynac, Castelnaud, LaRoque, Sarlat, Les Eyzies, Fanlac, Rocamador, RoqueStChristophe, Belves, Domme.